- I want to deliver delicious Japanese foods in a fresh state to overseas restaurants and pubs! - Consignees have requested delivery within a certain time period. Is there any way to fulfill such requests? - I want to sell my products overseas in the future! I am looking for support when the number of products handled increases. 1. We will collect to consolidate fresh cargo from all over Japan to Yamato Group warehouse, utilizing service such as Cool TA-Q-BIN and etc. 2. The consolidated freight is shipped overseas via refrigerated air transport. 3. 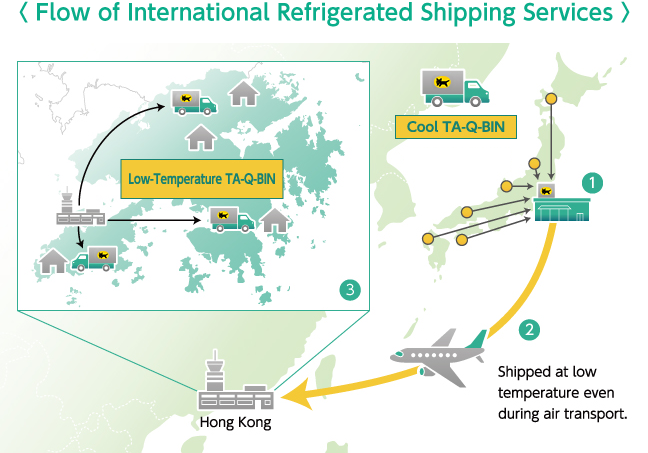 After freight arrives at the local airport, it is delivered to various destinations via Cool TA-Q-BIN. *In some cases, service may not be possible due to customs clearance conditions. Items are delivered fresh through refrigerated shipping during all stages, from upstream to downstream phases of the cold chain. It enables the consignee to receive packages at a time period of their convenience sending via TA-Q-BIN, but not route delivery. If your company establishes a business for full-scale sales of Japanese food products to overseas markets, the warehouse work and collection/delivery operations, normally performed by your company, can be outsourced by Yamato Group. This realizes variable costs and enables your business to expand globally while keeping, investment to an absolute minimum.